Crossroads by Mary Ting, gives a refreshing new take on the YA Paranormal Romance Genre. Claudia is a teenager who loses her once best friend on Homecoming night. Ironically, the two shared the exact same name, both first and last. Claudia’s loss opens up a whole new world for her. For many years she had always dreamed about this one place in particular, filled with a peace unlike any other. It was always a serene experience for Claudia. However, after her friend’s death, she soon discovers that the place of her dreams may not actually be a dream at all. She learns that it is a place between heaven and earth. Basically, it’s a bit of a pit stop for spirits, before they enter heaven. Despite the fact that it’s a place for spirits between heaven and earth, Claudia, seems to be an exception, she’s the first ever human to be able to exist within both realms. Her existence in both realms comes at a price. It results in demons and the fallen taking an undesirable interest in her. The danger in which Claudia now finds herself in, soon results in her being placed in the care of Michael, a nephilim, who is a cross between a human and an angel. It is forbidden for his kind to love a human, but Michael is put to the test when he must guard Claudia. 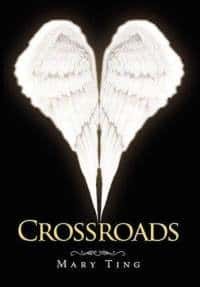 Crossroads is a unique getaway read for those who enjoy YA paranormal romances. The Christian elements found in the book are rarely visited, especially in such a genre. Ting’s debut novel is well written and sure to please teenage girls and women readers who are anxious for something outside the box. I want to have this book I think this is a inspiring books..Thanks a lot for sharing this..I might this book.. I think they are going to do a giveaway!